Imagine Wayne Rooney, Andy Murray, and Mo Farah exchanging the glamour of their careers for the brutality of war—and quietly giving their lives for their country. Today the news would be dominated by the sacrifice of Britain’s most famous sporting icons. A century ago the brightest sporting stars of their generation did just that: hundreds of thousands of sports stars rallied to their country’s colors: many never returned from the mechanised carnage of World War I. The names of Walter Tull, Edgar Mobbs, and Percy Jeeves are unfamiliar today—lost in the terrible lists of the dead of World War I. But they belong among the pantheon of true British sporting heroes. All were—quite literally—at the top of their game; all made the ultimate sacrifice in "the greatest game of all"—war. 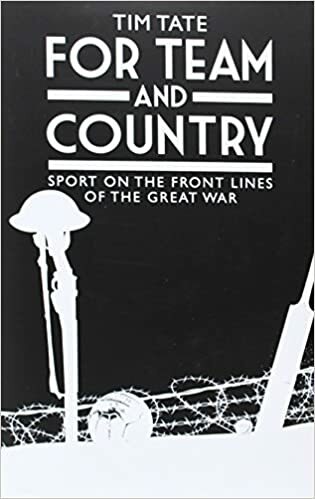 For Team and Country reveals how sport itself was Britain’s first and most vital recruiting sergeant in the fight against Germany, and tells the remarkable and inspiring stories of the sportsmen whose prowess on the field was matched only by their bravery in the King’s uniform. and his death was met with grief by the men of his regiment (according to his commanding officer ‘almost every man was weeping’) as well as throughout England. Such was the impact of his death that his father was convinced the Germans had deliberately executed his son so as to damage British morale. Alfred Maynard was in every way a warrior. At Cambridge University he established a fearsome reputation in the second row of the scrum – locks being traditionally regarded as a team’s enforcer.